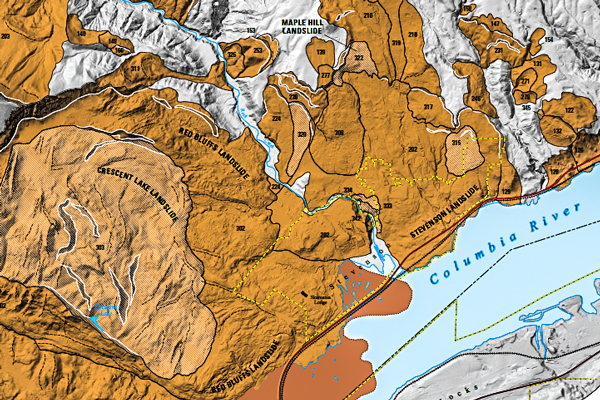 Recent lidar mapping of large landslides in the western Columbia Gorge in Skamania County, WA, shows that there are many more landslides than previously thought. The mapping area contains at least 215 discrete landslides of various ages — ranging from more than 15,000 years old to currently active. Most are translational landslides failing along bedding-parallel weak zones in the gently southward-dipping Eagle Creek Formation. About two-thirds of the mapped slides are remobilized parts of older landslides, and about half of those have resulted from more than one episode of remobilization. Crescent Lake landslide, a currently active remobilized part of the Red Bluffs landslide, west of Stevenson, Washington, creeps southeastward downslope during the winter rainy season at rates up to about 40 cm per winter. Analysis has also revealed that a large (nearly square kilometer) block of terrain upslope of the Red Bluffs headscarp, crept about 30 cm downslope from 2007 to 2011 and may pose a significant future hazard to downslope areas. Tom Pierson is a senior research scientist at the USGS Cascades Volcano Observatory in Vancouver, Washington, where his investigations focus mainly on volcano hazards involving lahars (mudflows), floods, and landslides—processes occurring both during and following volcanic eruptions. Since starting with the USGS in 1981, disaster responses and research projects have taken him beyond the Cascades to restless volcanoes in Alaska, Japan, the Philippines, New Zealand, Ecuador, Colombia, Chile, and Mexico. He is especially interested in interpreting hazards information from volcanic deposits and in educating emergency management officials and the public about volcanic hazards. Tom has MS and PhD degrees in geology from the University of Washington, and he is an adjunct professor of geology at Portland State University and a licensed geologist in the State of Washington.